In recent weeks, Iain Duncan Smith received a stern rebuke from the UK Statistics Authority (UKSA) for his and his department’s blatant abuse of statistics – and then lied about it to the House of Commons, claiming not only that he had not been rebuked but even that it was Labour that the UKSA had criticised. Being caught in a lie to the House used to be an automatic resignation offence, but in this government it’s more likely to get you promoted. However, the odious Smith is not getting everything his own way. 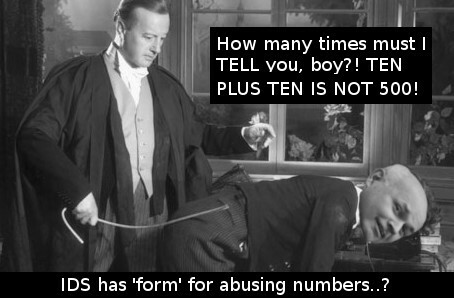 Last week I was told that the Commons Work and Pensions Select Committee (WPSC) was planning to haul Smith over the coals for his wanton abuse of statistics to tar benefit-claimants as ‘shirkers’ and to make the government’s ‘reforms’ appear to be working when they are not. I was asked to keep the information to myself until the right moment, so that Smith wouldn’t be forewarned about his ‘carpeting’ any earlier than necessary. However, a few days later the story broke anyway, so the news is now out. However, I can reveal that Smith faces not just one but two separate grillings over his ‘flexible’ approach to truth. Or lies, as most of us would call them. An MP, who shall remain nameless but who is closely connected to the Work and Pensions issue in Parliament, tells me that the first of these is likely to take place at the review by the WPSC of the Department of Work and Pensions’ annual report which is due soon. The second is at a special, one-off inquiry that the WPSC is trying to arrange before the summer recess of Parliament. Smith and his colleagues have lied about disability benefit fraud, about the impacts of the changes to benefits, about the poverty that will be inflicted on those affected, and about supposed huge numbers of people claiming disability benefit abandoning their claims rather than face a medical examination. It’s essential that Smith is called to account for these many lies – but no doubt he’s currently working hard to try to have these grillings quietly cancelled or diluted. You can help to ensure that he doesn’t succeed by writing to the Work and Pensions Committee at workpencom@parliament.uk to insist that these sessions to go ahead. Please get writing and let’s make sure that Smith and his team are hoisted by their own petard. Who’d have thought it a Tory MP lieing about what he said. Sounds like a case of follow your leader. By the way I recommend the new Book “the Body Economic by Stuckler and Basu –Why Austerity kills is its sub-title and is relevant to your blog on IDS and these matters generally. The references are copious are useful for you I’m sure. IDS is a thicko of the first order. But he thought everyone else was thicker than him. How wrong he was! The fuckwit! Enough lies about benefit claiments being lazy skiving scroungers,its hard work will pay in your words. He needs to be asked by what measure he rates the success of Universal Jobmatch. If it is by the people flocking to register they are mostly forced by threat of JSA sanction. Counting success of a site by forcing people to use it and then not displaying statistics on how helpfull it actually is (ie how many people actually got a job through CV matching is just plain illogical.